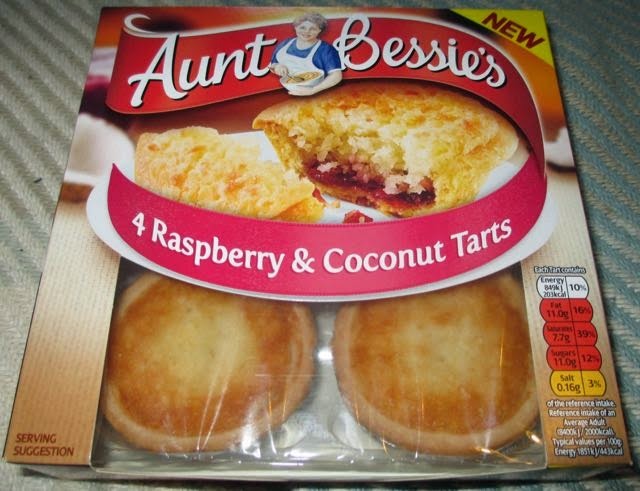 Famous for her Yorkshire Puddings, roast potatoes, and frozen ready meals, Aunt Bessie has recently brought out ginger cakes, carrot cakes and also these Raspberry & Coconut Tarts. Been as though I haven't had a Raspberry & Coconut Tart for years I just had to pop open the box of four tarts and have first bite. Spreading them out 'evenly' between the three of us, as in I took my greedy two tart share and scampered upstairs to eat them on the bed. Yes, this would be the first and most likely last time Cinabar would catch me in bed with a couple of tarts! My justification being that I needed to eat more tarts due to blogging obligations. Once popped out of the foil tray the slim outer pastry melted in my mouth and the tart had a deep filling of coconut with sweet raspberry jam at its base. I found these tarts a really tasty treat, not too sweet, just enough to tantalise my tastebuds and not make me feel too naughty for nicking two of them! Each tart contains 203 calories, 11g of fat and 11g of sugar. Ingredients included; see photograph.